If you're a college football fanatic (and it's been well established - perhaps, one might say, over-established - on this blog that I am) there are certain scores from certain games that have almost mythical, mystical qualities, so much so that it seems as if no game ever played again should be allowed to conclude with the same score. Centre - 6 Harvard - 0. Notre Dame - 10 Michigan State - 10. Nebraska - 52 Colorado - 7 (wait, that one may just be me). 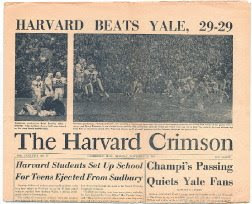 And, yes, Harvard - 29 Yale - 29, made famous by the headline that ran the following day Harvard Beats Yale 29-29, from which this 2008 documentary gleans its title. Rafferty's style is one of extreme simplicity. He switches back and forth from the actual television game footage to present-day interviews with the players, only occassionally mixing in a few photos and other things of the sort. Thus, if you don't enjoy watching this most storied of sports this may not be the film for you. I, however, had read a great deal about the game but had never actually seen any of it other than a few clips here and there and so I drank it in like the Pilsner Urquell in my hand (there I go again!). It is filled to the brim with titanic shifts of momentum, big plays galore and, of course, a plethora of controversial calls. A critical facemask penalty called late on Yale in which we first see Yale QB Brian Dowling defiantly declare "There was no penalty" only to then switch to the Yale player on whom the penalty was called and have him state "Good call". The film takes the time, though, away from game footage to paint the picture of the young men who filled this contest. Harvard's Pat Conway, who had been a marine in Vietnam and was now playing football again for the first time in a long time. The aforementioned Yale QB Brian Dowling, a superstar who had not lost on a football field since seventh grade and who was also the basis for the character of B.D. in Garry Trudeau's "Doonesbury". Anyone who still clings to the archaic feeling that college football isn't a religion should look no further than the player who was a son of a most devout Jewish father who happened to have his very first game fall on Yom Kippur to which his dad decreed, "You play, I'll pray." Amen. There are even key characters offscreen, like one Al Gore who roomed with a Harvard offensive lineman named Tommy Lee Jones (yes, that Tommy Lee Jones, and who tells a couple brief stories involving the future Vice President which is just crying out for a sitcom). A Yale player roomed with one George W. Bush. Another Yale player dated a young woman named Meryl Streep. But these people are kept offscreen. After all, it is not their story, it is the players'. The final minutes, in which Harvard miraculously overcomes a 16 point deficit, to tie the game is recounted in a thorough manner, showing how the greatest games so often turn on a plethora of the littlest plays at any given moment. In the end, when backup QB Frank Champi, a former javelin thrower who would quit the team next year, has led his squad to the ultimate comeback, he says something that stayed with me and makes me wish all who love and care about college football would make a point to watch this film. He advises that because the game was a tie everyone remembers it, and that's true (even though a couple Yale players refer to the game as a "loss" which, of course, technically it isn't). If there had been overtime, like there is now, one team would have won, one would have lost, and the possibility that 40 years later the game would still have such a hold and both teams would reconvene for a film about it are quite slim. In this era obsessed with the bottom line I found it to be a breath of beautiful fresh air. It's a stirring argument against the sport taking up a playoff. I heard people talk about the cinderella Utah Utes from a year ago and how they were denied a shot at the title because of the absence of a playoff. Yet, the odds they would have won a playoff are, admittedly, not good. And which do you think the players and alumni would most fondly recall 40 year from now? Utah Utes, losers in the 2008 College Football Playoff Quarterfinals? Or, the Utah Utes, undefeated and 2009 Sugar Bowl Champions? I'm a romantic and I guess that is why I've always been drawn to college football more than any other sport - its romantic nature. It is the only sport left that can have those open endings and that crowns what used to be termed a "Mythical National Champion" and that allows a bunch of kids in college to get weepy-eyed over a bronzed turkey. In college football so often, again and again, a mere game transcends that fact to become something more, something deeper, something profound. A Harvard player says, "Let's keep a little perspective, it's just a football game." And that's exactly why it wasn't.